Don't be caught with your pants down. Here are some essential tips and tricks to properly using the bathrooms around Southeast Asia. For travelers visiting SE Asia, there are few basic things to get the hang of for proper bathroom use. 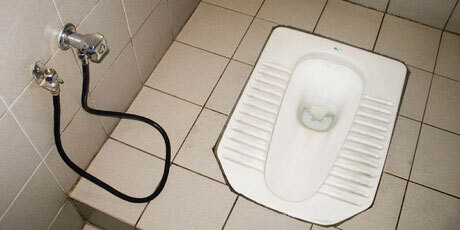 Generally there are two types of toilets, Western style and squat toilets. Squat toilets are just what they sound like, a toilet built right into the floor that you squat over. In addition to the spray hose, they usually always have a water supply or water bucket for you to use to manually flush afterwards. Many people think these are healthier for humans to use, ergonomically speaking, but they definitely take a certain balance and finesse to master. A sense of adventure is also important, because usually the entire floor is a wet room and everything is somehow soaking wet all times. You need a certain Olympic athlete-like quality to balance over an open hole on a wet slippery surface and also be able to use the bathroom at the same time, all with a line of people standing right outside your door waiting to hold up scorecards to grade your dismount. It can be a bit of pressure. Public restrooms around SE Asia usually have both kinds of toilets available with signs on the stall doors so you can choose which kind of adventure you're up for that day. Word to the wise - toilet paper can be a rare find. Sometimes there's one dispenser on the wall right when you enter, and sometimes it's in the stalls, but it can be either or neither. To be on the safe side, always carry some tissue. I'm a bit spoiled because I housesit full-time, so I always have the luxury of private bathrooms in homes and rarely have to brave the horrors of public restrooms. 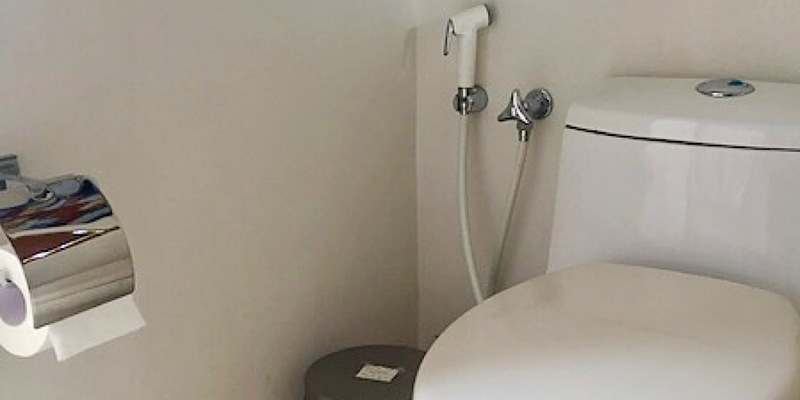 There will always be these 4 things you will need in a typical SE Asian toilet setup. 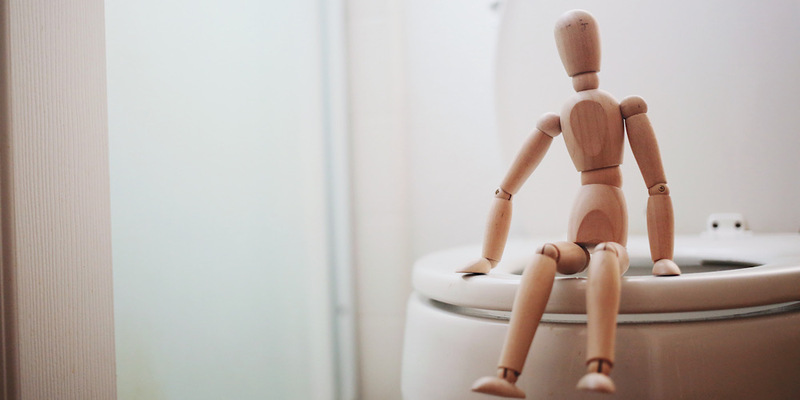 Most folks are accustomed to just the simple toilet + TP setup, but the bum gun and trash can are essential additions here for the proper potty experience and here's why. Most plumbing in SE Asia cannot handle any paper whatsoever being flushed down the toilets. It will cause massive problems and you definitely don't want to be that guy. So instead of using wads and wads of paper, you use the bum gun to shoot yourself clean. 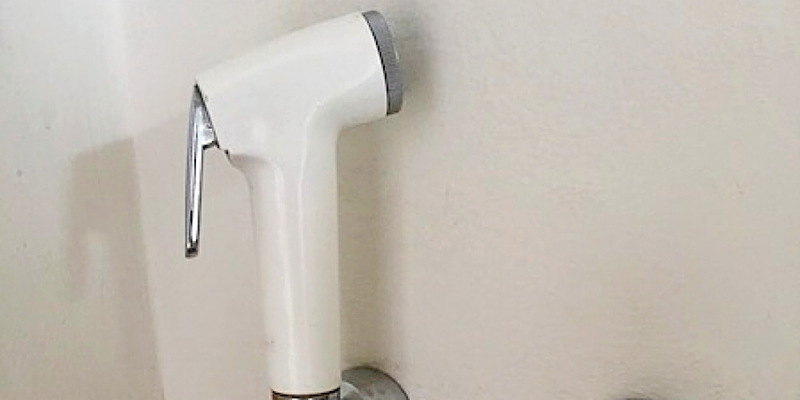 A spray water hose is always mounted right next to the toilet for you to spray your bits and parts after you do your business. This gets you squeaky clean so you only need a bit of paper to dab dry afterwards. The bum gun is an acquired skill. Many first-timers drench the bathroom, the ceiling, their shoes, their backs, etc. But it's not as difficult or intimidating as it seems. Just point and shoot. Granted it is upside down and backwards and behind you and you can't see what you're doing. That's all just part of the fun we're having. Because you can't flush anything down the toilet except the business, all paper goes into the small waste bin that's usually close to the toilet paper for easy access. Westerners have a very trained muscle memory from a lifetime of wiping and throwing in one complete swoop, so you have to consciously remind yourself to move your arm over and throw the paper into the can instead of simply dropping it in. 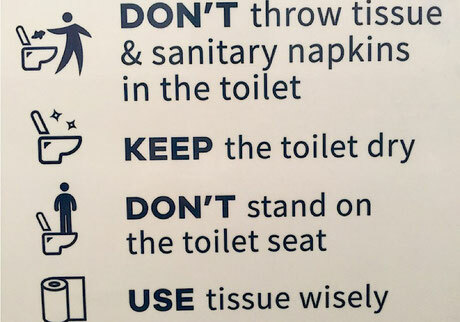 You'll encounter these potty rules in most Southeast Asian countries, with the exception of ultra modern Singapore, but they have their own crazy rules, even for the toilet. After some practice, it will just become a new habit you've acquired in addition to your new self-hosing abilities and then you'll practically be a whole new person with a new set of skills. And everyone loves people with skills so it's a win-win.